In Singapore, the National Youth Achievement Award (NYAA) is an exciting personal challenge to young people aged between 14-25 years old. It is a nationally and internationally recognised award (through the The Duke of Edinburgh’s Award International Association). NYAA aims to develop and maximise the potential of young people through selfless community service, challenges of adventure, skills development and physical recreation so that they may be exceptional individuals who can contribute effectively to their communities, society and the nation. 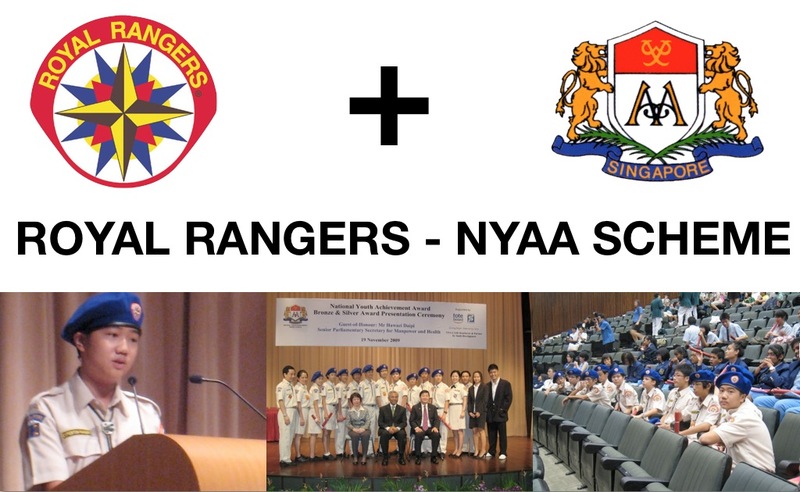 As one of the operating authorities for NYAA, Royal Rangers Singapore can function as award coordinators for youths working towards their awards. Through the Royal Rangers program, youths can work towards achieving this award in parallel with the Royal Rangers awards. Commander Heah Yong Chian is the first Royal Ranger to receive the NYAA Gold Award through the RR program. In a ceremony held on 28 October 2011, Yong Chian received his award from His Excellency, Tony Tan, President of the Republic of Singapore. RR Singapore was in the news with Adventure Ranger Joel Tan being featured in the Straits Times of 17 August 2011. He had just received his NYAA Bronze medal and gave the speech at the ceremony of his experience. The National Youth Achievement Award (NYAA) was officially launched on 9 May 1992 by the President of the Republic of Singapore at the Istana. The aim of the NYAA Programme is to encourage young people between the ages of 14 and 25 years to develop personal qualities of self-reliance, perseverance and a sense of responsibility to themselves, to society and to the nation. To date, nearly 130,000 young people in Singapore have been motivated to undertake a variety of voluntary and challenging activities in each of four areas, namely Service, Adventurous Journey, Skills and Physical Recreation. In addition, young people are required to undertake a Residential Project at the Gold level. The criteria for an Award are those of self-improvement and effort as participants are judged on personal achievement and individual capabilities. The NYAA Singapore is a Full Member of The Duke of Edinburgh’s Award International Association, which operates in 120 countries worldwide under various titles. Our RR can function in their local church and we do not have to dilute the RR programme content to comply with MOE guidelines since we are not under their jurisdiction. RR as an Operating Authority of NYAA means that our coordinators can also endorse for other youths from the schools, community, church etc.. who are pursuing their NYAA. Hence, these youths can approach us directly to help them earn their NYAA. Our RR who served the community in church activities like, food distribution, community home visitation, CCIS, Charity events, etc., can now be considered towards fulfilling their NYAA requirements. For example, last December 2009, our RR who ministered to the orphans in Philippines could clock in the hours towards NYAA, in addition as well as fulfilling their Christian Service Merit. Rangers who are home schooled will now have an internationally recognized award, which will help them when they apply for local and foreign universities. The RR-NYAA scheme was spearheaded and trialled at Outpost #12 in 2009. Their first batch of bronze NYAA awardees were presented with their awards in 2009. In 2010, the scheme was officially launched in all Royal Ranger outposts.